Ever notice how the Disney Princesses are a frequent stop on the Internet train? On the list of most-desired occupations, Princess tops the chart. Who can blame anyone? They are a fantastic combination of bright, beautiful, adventurous, and capable. They’ve got some attitude and, usually, some magic, combat skills, or even just an extra dose of attitude to back it up! And, since each are so completely varied from one to the next—perhaps some facial designs, aside—each tale of princess glory is each their own. Fortunately, there are a couple princes that stand all on their own and not only help to save the day, but do so without overshadowing the princesses. Join the ranks of the greatest princes in the fairy tale kingdoms with this Prince Charming costume. The long tails of the coat hang low to your knee and shines white with golden accents and buttons. 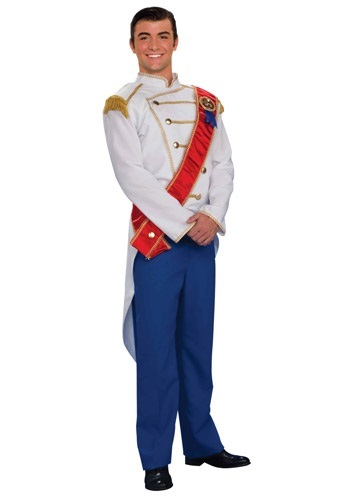 The elastic waistband of the blue pants keep your trousers comfortable while the staggering blue makes for a perfect contrast with the shining white and gleaming red sash. Pick up a sword accessory or an additional prince or princess costume to complete the court and go on adventures of your own. The outfit overall is pretty good, though arrives super wrinkly and needs careful ironing to avoid damage. The pants are very baggy and a bit crappy though - i'd recommend wearing your own blue pants. The shirt/top is fantastic though. good detail.